Kiss has had its ups and downs, but now many decades later they still are on top of the rock and roll world. 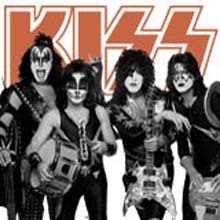 With more than 100 million records sold no wonder why you can find such a huge list of Kiss guitar tabs below. It is also the band who has received most gold albums in USA. The band started out as shock rockers in 1973 and soon became well known for their stage performances with fire, smoking guitars, blood and high volume. Although it is a very visual band, their catalogue is full of good music and classics. You will find Kiss tabs to them all below. Solo guitarists has been coming and going and so has the drummers, but Paul Stanley on rhythm guitar and Gene Simmons on bass has always been the leaders. The style can be described as hard rock with melody and a good ballad here and there.